The price of entry to PC-based virtual reality just got a lot lower. 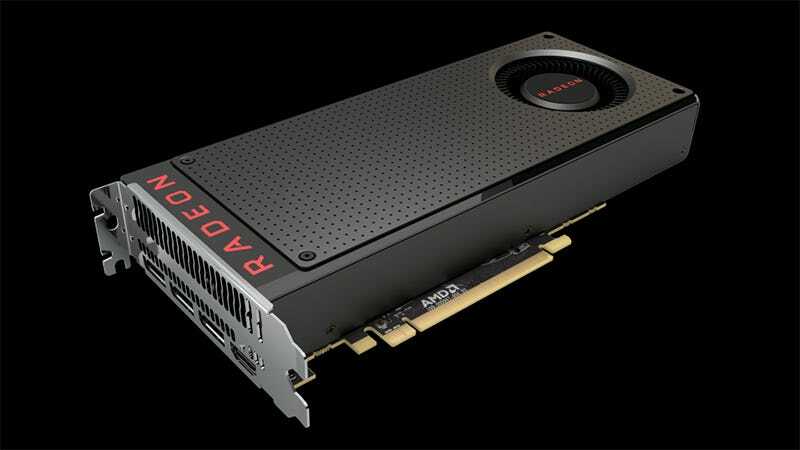 The first graphics card based on AMD’s Polaris architecture arrives at the end of June, promising VR performance of a $500 GPU for less than half the price. Where Nvidia aimed high with its first two next-generation graphics cards, the GTX 1070 and 1080, AMD’s aiming to sweep the GPU market’s leg with the Radeon RX 480. Available at the end of June for the low price of $199 for the 4GB version, the RX 480 aims to get VR capable graphics into the hands of as many gamers as possible. AMD calls it the “Water Drop” strategy, and it’s basically the exact opposite of what Nvidia is doing. Rather than debuting the power-efficient 14nm FinFET Polaris architecture with a powerful, moderately expensive graphics card, AMD’s plan is to aim for the widest audience first in order to increase market share faster. Performance-wise the isn’t likely to top Nvidia’s latest cards on its lonesome. The RX 480 should deliver performance comparable to Nvidia’s former flagship, the GTX 980, or AMD’s own Radeon R9 390X. The amazing bit is that it does this powered by only a single six-pin power connector for a great deal less money. During the card’s unveiling at Computex 2016 yesterday, a benchmark was displayed showing two RX 480 cards in Crossfire outperforming a single GTX 1080 in Ashes of the Singularity running DirectX 12. And while Ashes has always been very Radeon-friendly and Crossfire can be kind of a crapshoot as far as game support goes, that’s an impressive feat. AMD is really pushing VR with the RX 480 and RX series in general, calling it “a disruptive technology that adds rocket fuel to the VR inflection point, turning it into a technology with transformational relevance to consumers.” Trimming down to entry cost for virtual reality is great, though until the headset tech is cheaper, I don’t see how much good a less expensive graphics card will do. But for traditional PC gamers looking to boost their graphics power on a budget, the RX 480 looks like it could be a golden ticket. Hopefully we’ll be able to get our hands on one and put it through its paces before it goes on sale at the end of June.